Sure, we’ve all heard of pineapple upside down cake, but what about that same type of concept with a different fruit? 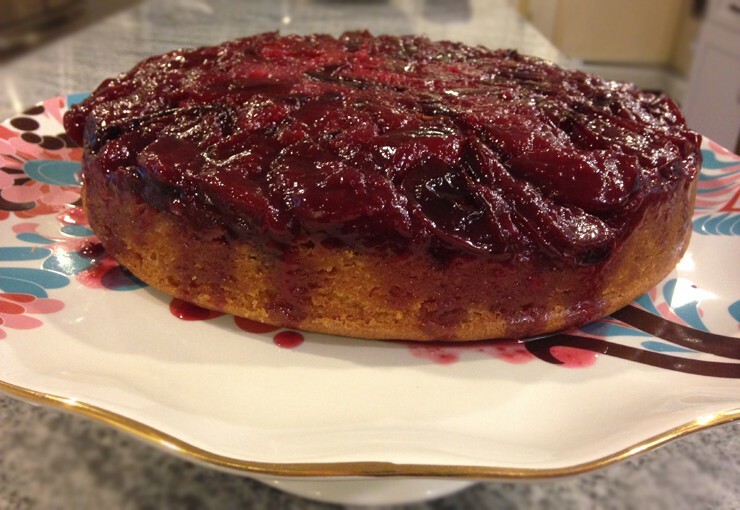 This easy dessert recipe for plum upside down cake is traditional with a twist – the plums at the bottom cook with a caramel and the end result is a jammy plum top to a delicate buttery cake. The perfect combination! This dessert is the perfect thing for summer entertaining, your next barbecue or a special weeknight dinner. If you like this twist on a classic dessert, feel free to experiment with other stone fruits like peaches, apricots, or nectarines. This would work nicely with a combination of strawberry and rhubarb (pie shouldn’t be the only place to combine those lovely ingredients), blueberries, even bananas. You can use this base recipe and continue to make upside down cakes all summer long (and continue it into fall with a caramel apple upside down cake… never mind, don’t wait until fall for that one, it sounds way too good). 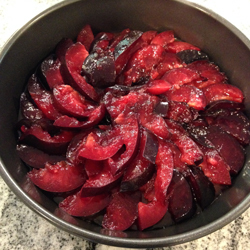 Couple tips for the recipe should you use plums – make sure you choose plums that are ripe, but not too soft. You don’t want them to be mushy when you slice them; it will make it harder to arrange in circles and the end result won’t look quite as orderly and neat. Also, be real careful when you flip the cake out of the pan; the juices at the bottom will run out and you don’t want to burn yourself. Combine the sugar and water in a small saucepan; bring to a boil without stirring and then cook over high heat until an amber-colored caramel forms, about 5-7 minutes. If crystals are forming on the sides of the pan, use a wet pastry brush to wipe it down. Remove the pan from the heat, whisk in the butter, and immediately pour into a 9” round, 2” high cake pan. Arrange the plum slices in circles then sprinkle with lemon zest. Whisk the crème fraiche (or sour cream) with the milk, vanilla bean paste, and vanilla extract in a small bowl. In the bowl of an electric mixer, combine the flour, sugar, baking powder, baking soda, and salt. Add the butter and beat at low speed until it looks like wet crumbs (only about 30 seconds). Pour in the beaten eggs on low speed until everything is mixed together. Turn the mixer up to medium high and beat until light and fluffy, about 1 minute. Reduce the speed to medium and beat in the crème fraiche mixture until smooth, roughly 30 seconds. Scrape the batter out of the bowl and onto the plums; spread evenly with a spatula. Bake the cake for 55-65 minutes, or until golden and springy in texture (test around 55 minutes then add any time that is needed). Let the cake cool in the pan on a wire rack for 30 minutes and then place a large plate over the cake pan and invert onto it. Serve warm (or at room temperature), either plain or with a scoop of vanilla bean ice cream.